I have had a wonderful last three days with loads of time in the studio, and lots of great results. Woohoo - my mojo is back! The stencilled layer was covered with crinkled tissue which was adhered with gel medium, and then coated with another layer of the gel medium. I then rubbed some Inka Gold (paste) in gold gently over it to 'catch' in, and highlight, the raised wrinkles in the tissue. The sentiment panel was a SB label cut in gold paper and the greeting embossed in red. This was then layered over a SB die cut made from gold DCWV metallic card. The flowers were punched with Stampin' Up mini punches in the two gold papers, and layered before a red rhinestone was added. The lace and the ribbon were the finishing touch. I really enjoyed making this card, playing with the textures and materials, and with the final result. I have had a flat period where my mojo has departed, so any cards I have made have been variations on previous ones... not good. So last night I went to Pinterest and looked at the cards I have pinned from there, and today I flew. This card is a CASE of a CASE I have discovered, after following the pin to its source. I took the hexagonal shapes, (cut from some card from a DCWV Metallic Stack) but cut more of them, and positioned them slightly apart. I positioned the sentiment (a retired stamp from The Crafts Meow) differently, embossed it, and added an off-cut and pearls underneath it, that was not on the original. The butterfly (a retired image form Layers of Color) was stamped on glossy purple paper and embossed with lavender ep. The card stock that I used as the base is a pale gray card that is made from recycled material, and it has a fine, slightly darker fleck in it - something a bit different that adds interest to the card. This butterfly was stamped on the facing page of the insert, and I have shown it at this size to show the wonderful detail it has. I printed and coloured this Daisy Doodle image with prisma pencils some time ago, and today had time to 'play' and mount it onto a card. I started by cutting the image out and gently smoothing on some pale blue chalk onto the background before I removed the die. and added some kindy glitz to glam them up. The finished panel was mounted over some cork that I had cut with another die, and sponged the edges of with Espresso ink. The sentiment was gold embossed and cut with a die – the orange tag is the same colour as the base card stock, and was threaded with gingham ribbon. The same ribbon was also used to make a bow on the stem of the flower, which covers the leaves in the image. Some rhinestones were placed around the card after assembling it. The background patterned paper was from an Amy Tangerine pad. Another 'boy' card, and again a recycled element, and this time it is the image, which was fussy cut off an old card. I started with a creamy card base, and sprayed it with some silver and gold shimmer sprays. Some black and white papers were woven to form a base, and this panel was mounted above a strip of silver and clear washi tape. The sentiment was gold embossed on red card, and die cut, with a gold pen run around the inside of the die before it was removed. In this photo you can see some of the shimmering background. I was recently given some old cards to up-cycle, and as soon as I saw this background my mind went to these chipboard cars that I recently purchased. The cars were painted with black gesso, then run through the cuttlebug in a Tim Holtz folder, and had Inka Gold rubs in Gold and Bronze rubbed on them. Then added some magic mesh (from my stash, it is over 10 years old and it still stuck!!) and rubbed some Inka Gold Silver rub over it. The final addition was the sentiment panel - a silver embossed stamp from Kiwi Stamping, (again an original from way back) The letters were filled in with a sparkling blue pen, and rubbed silver around the edge before adhering the panel with silver brads. This week at CCC Digi Creations Challenge we are being sponsored by Bugaboo Stamps, and the winner will receive 7 Bugaboo images of their choice. 'For the Man in your Life'. My card uses the bugaboo image Gus - Birthday. As soon as I saw the sentiment, I knew which embossing folder I wanted to use with it. After embossing the background, I rubbed Inka Gold silver rub on it. I coloured the image with water colours, then added Glossy Accents to the balloons and Gus's glasses for some dimension and shine. The final touch were some embossed brads - they were originally a dull, powder finish, but I read how to emboss them this weekend, and this is the result. I mounted both the image and sentiment on black card before placing them on the card. I have prepared this card as one of the ones I will teach at my card class this week. I have CASE'D (copied and changed elements) it from Michelle Pearson at Inspiration Blooms, where she shared a tutorial on this technique. and as can be seen here, I painted an iridescent medium over the quilted layer (before cutting the butterflies out). Rather than 'doodle' around the central panel, I sponged all the layers, and the edges of the butterflies with Victorian Velvet DI. When I made my DT card using the blue vellum butterflies from Stamp Art Design I had one butterfly over, so I decided I had to use it! I wanted to try a technique I had seen online (but can't remember where). I did not have the exact supplies so I improvised by sliding the pads on a kaleidacolor Blue Breeze stamp pad together, stamping that onto an acrylic block, lightly spritzing it with water then stamping it onto card. I was quite pleased with the resulting ombre effect. This in turn was sprayed with silver shimmer mist. I fiddled for ages to get a pleasing look to the card, eventually layering the ombre panel over some glitter card, and adding a silver ribbon too. The sentiment was stamped with one of the inks from the multi coloured pad, cut and sponged before it was removed from the die. The final details were the white liquid pearls on the butterfly body and die cut, and the doodled edge. the sentiment, so elegant and goes anywhere, used it for years. I had meant to have blogged before now, but while life happened, blogging didn't - I did get to spend some very special time with family recently, as well helping Hubby with life - he is getting much more mobile now, and is confident on his crutches, which is a great improvement. Hopefully he will be out of the moonboot in another two or three weeks. 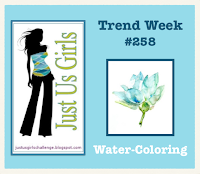 This card was inspired by challenge #27 over at the Creative Craft Cottage blog. I took three colours from the palette, and an older sketch from Stamplorations blog, and tried the technique that is currently very popular - cutting out a shape and then putting the shape back in, whether you use the same cuts that have been coloured or different card. The sentiment was stamped in Bamboo Shoot ink, and pink sequins placed near the flowers. Centres in the flowers is gold liquid pearls over the yellow base card, and I also added some of the pearls in the centre of the sequins. and yellow near the corner on the white layer. Overall, CAS card that I am very happy with. It is time for another challenge over at the Creative Craft Cottage Challenge, and this time it is a sketch and/or colour challenge. I chose to work with the sketch, which I flipped. The image I used for the panel came from McMahon Five Design - unfortunately I cannot link to the store as it is currently closed. I printed it out, cut it using an oval SB die and lightly sponged the background before I removed it. The flowers were coloured with prisma coloured pencils. The wee stamp was one that came as a freebie with a magazine, supplied by Crafty individuals. I stamped it with Cocoa Ink and coloured it with chalks, and added some Kindy Glitz for a wee bit of sparkle. The elements of the sketch were made using lace for the horizontal line and web ribbon for the vertical banner shape. I chose the Butterfly Border set to use, which also has an individual butterfly image in it, which for this card I printed off on pale blue vellum. I printed the border off on a piece of dp from a Rosie's 6x6 pad, and painted over it with some oyster Twinkling H20. The centre panel was stamped and silver embossed on some pale mauve card, and sponged with some violet ink before removing it from the die. The background paper was a pearlised paper, distributed recently at a craft fair as a flier - I simply turned it over and used the unprinted side and embossed it, before mounting the whole on mauve card. The final details were pearls and some liquid pearls on the bodies of the butterflies.